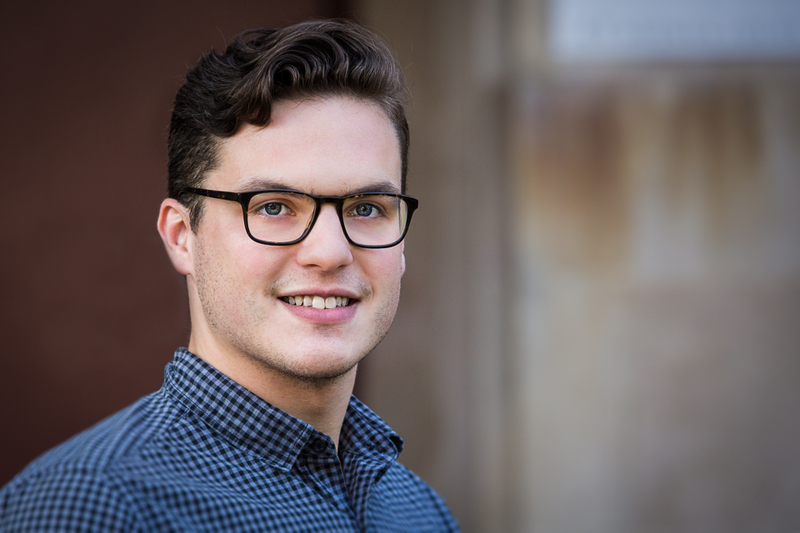 Shawn Fayer MS ’16 is the project manager of the BabySeq Project, a randomized control trial assessing the utility of genomic sequencing in newborn infants. Working in Boston’s Brigham and Women’s Hospital, Fayer hopes to inform parents about disorders their baby may develop later in childhood by sequencing the infant’s genome, potentially allowing for earlier diagnosis and more effective treatment. Fayer spoke with us recently, sharing some insights on his career as a genetic counselor and how his time at Brandeis helped shape his work with the the BabySeq Project. You can also hear Fayer speak about the project on NPR. What is the primary importance of your research? The BabySeq Project is one of four projects funded by the National Institutes of Health within the Newborn Sequencing In Genomic Medicine and Public Health (NSIGHT) consortium. Each project employs genomic sequencing during the newborn period in a different way to study specific questions pertaining to sequencing in this population. The BabySeq Project is the only fully randomized control trial and when analysis concludes we will be able to make early assessments on the utility, perceived benefits, and potential harms of giving this information back to parents. As the field of genomic medicine continues to expand, the natural question of population level sequencing at birth comes up. Although genomic sequencing will not become adopted to the level of newborn screening, it is very important to generate this data now as more and more companies are joining the pool of consumer genetic/genomic testing. These companies continue to push the boundaries of testing, making newborn genomic sequencing as an option for new parents an inevitability. The data we generate may be important in setting guidelines and recommendations for such testing. What are the ethical concerns associated with studying a young child's genome? Sequencing newborns raises many ethical concerns. First, loss of autonomy is major consideration as newborns are not making the decision to be tested themselves, and will end up with massive amount our genomic data when they have grown up. We are also faced with the question of genetic discrimination in the event that newborn sequencing identifies a health risk. While it is reassuring that the Genetic Information Nondiscrimination Act (GINA) protects us in the areas of health insurance and employment, there is always uncertainty about how laws might change in the future. Additionally, when we sequence an infant’s exome, we analyze genes associated with childhood onset conditions. There could very well be a mutation for an adult onset condition present in an infant, but we are filtering out these genes and, thus not analyzing them. It is important that we explain to parents that we are not looking at these genes to avoid false reassurance. Also, we need to stress that we do not fully understand the genome or the effects of all mutations we can uncover. This can result in the dilemma of returning or not returning a result that we may not fully understand. Finally, all of these concerns are compounded when we offer sequencing to otherwise healthy infants. In an acutely ill infant, the potential benefit of finding a diagnosis through sequencing outweighs all of the potential harms, but when this infant is healthy, we tend to focus more on the potential harms and uncertainties associated with sequencing. For these reasons, it is critically important to have thorough informed consent sessions with each family interested in enrolling. Many parents are hesitant to participate in this project. Why is that, and what would you say to parents who feel unsure about allowing the sequencing of their children? Parents are hesitant mostly due to the myriad of reasons I already mentioned. These are all perfectly legitimate reasons to be hesitant to enroll in such a project. Many information seeking families decide not to enroll due to the potential for genetic discrimination. As a genetic counselor, it is my job to ensure all families are fully informed of potential benefits and harms and allow them to make these challenging decisions for themselves. What do you think the future of your research and genetic counseling in general looks like? Are we moving towards a world where we can manipulate the genes of unborn children? The future of newborn sequencing, in my opinion, will be an option for all families within the next few years. Due to the ethical concerns and uncertainties associated with this type of test, I do not think it will become a mandatory screen like standard newborn screening, but will become an option for parents who want to learn more health information about their newborns. As such, the field of genetic counseling will have to adapt and focus more on training for genomic sequencing. Why did you choose the Genetic Counseling program at Brandeis? While I’ve remained passionate about basic science research throughout my training, I began to feel a disconnect between my work and its potential clinical applications. Thus, I began to reach out to clinical genetics practices in Montreal, and was able to volunteer in the cancer genetic counseling clinic at Montreal General Hospital. There, I was first exposed to the real world applications of genetics in clinical care. I quickly became hooked to the idea of practically applying my knowledge base in genetics to make a potentially profound and immediate difference in the lives of cancer patients and their family members. These experiences led me to apply to genetic counseling programs, with Brandeis at the top of the list for its long standing reputation, experienced staff, and strength in research. What was the focus of your research at Brandeis? My thesis research at Brandeis focused on the psychosocial implications of hereditary colon cancer syndrome diagnosis during emerging adulthood (ages 18-25). This age group is of particular interest to the cancer genetics field because genetic testing is available from age 18 for conditions such a Lynch syndrome or hereditary breast and ovarian cancer syndrome. However, for those who test positive, there is no recommended clinical intervention between the ages 18-25 in most cases. This raises the question of whether offering genetic testing for hereditary colon cancer syndromes for 18-25 year olds could potentially cause more psychosocial harm than benefit if there is no available clinical intervention for these individuals. Through surveying nearly 300 Lynch syndrome patients with diagnoses across different age groups, we found that those who tested positive during emerging adulthood reported higher levels psychosocial functioning and lower levels of distress than individuals who tested positive later in life. The implications of this exploratory study suggest that clinicians who are hesitant to offer testing to this age group may be overly cautious and that emerging adults are more resilient with respect to these findings than adults in other developmental age groups. Did you have any mentors during your time in the program? The faculty of the Genetic Counseling program was absolutely wonderful! From the program directors to the professors for our required course work, all were excellent teachers with a gift of keeping students inspired and excited about the given topics. My main mentor during my time at Brandeis was my thesis supervisor, Gayun Chan-Smutko. Gayun is the assistant director of the Genetic Counseling Program and she encouraged me throughout my ambitious thesis project. Gayun also a senior genetic counselor at the Massachusetts General Hospital and lent a great deal of clinical insight throughout my time at Brandeis. How do the skills or knowledge you gained at Brandeis relate to your current work? Although my role as project manager is not a typical genetic counselor role, my genetic counseling skills obtained at Brandeis have been directly applicable to the day-to-day operations. Educating and consenting families into a project involving genomic sequencing for their newborn often becomes a highly complex genetic counseling session. Training at Brandeis provided me with the tools necessary to navigate this type of session. Additionally, the return of newborn sequencing results to parents is potentially a more sensitive and challenging session, but I’ve felt fully prepared to handle the broad scope of results returned to date. Finally, training in the Brandeis Genetic Counseling program helped to hone my organizational skills which have been essential to project management of such a complex research effort. What would you say to someone considering entering the field of genetic counseling? I welcome and encourage anyone who is interested in genetics or a healthcare profession to consider entering the field to genetic counseling. A great way to get your foot in the door is to shadow a local genetic counselor or attend an open house session. This is an extremely exciting time for the field of genetic counseling as it is expanding rapidly into new areas of clinical practice and research. As new genome sequencing and gene therapy technologies are developed and more widely utilized, there will be increasing demand for genetic counselors and an expanding role for the genetic counselor in modern healthcare systems.